A Inspection Of The Deck Will Inform You On The Conditions, Minimize Any Costly Repairs And Assure The Contractor Did It Right. A Licensed Building Consultant Certified By ASTTBC With Over 30 Years Experience. Deck Specialist Both Residential & Commercial. Document All Visible Issues And Provide A Narrative Report With Photos. Assure Works Undertaken By Today’s Deck Construction Standards & Code Compliance. Why Is Deck Safety Important? According to some leading construction industry experts, decks and balconies are among the most dangerous part of a residential building, if not the most dangerous. Too many tragic accidents, injuries even deaths have occurred due to decks not being properly checked for major safety issues or worse constructed by design very poorly. Many of these accidents can be avoided with a full visual deck inspection assessment. Every spring, before deck season begins, it’s a good idea to inspect your deck for any red flags, such as corroded fasteners, loose connections, rotted wood, mold, cracks, etc. If your deck appears to have any number of these issues, it’s important to bring in an expert who can check it out, make sure it’s safe and if not, provide you with recommendations that can help make it right. It is statistically proven that over 80% of the new deck and stair construction is incorrectly undertaken by not only the building owner to save on costs but also by handyman and so-called “professional contractors” that have no idea what the correct construction design is for deck and stair construction. It’s important to bring in an independent expert who can inspect the construction design and finish of the deck and stairs to make sure it’s safe and that it meets today’s building standards, practices, and building code requirements and if not, I will provide you with recommendations that will help make it right. 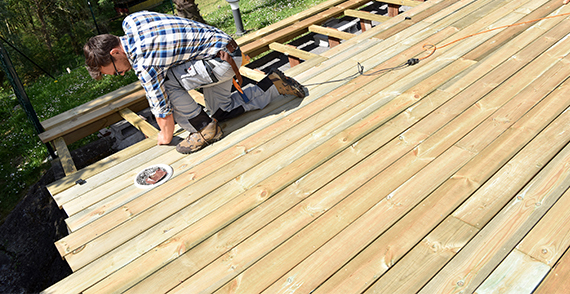 A deck inspection examines the overall safety of the entire deck structure, including all major components (where accessibility is permitted). Our priority is to provide you with unsurpassed professional services. I take care of your best interest and dedicate myself to serving and representing only you with integrity, professionalism and honesty. © 2015 Pacific West Home Inspections. All Rights Reserved.